When I think of shots, “healthy” is usually the last thing that comes to mind. But wellness shots are a recent health trend that’s really taking over. These potent little tonics pack a concentrated dose of vitamins, micronutrients, and antioxidants. They’re being used for everything from an energy boost, to gut health, and even to fight inflammation depending on the ingredients you use! Wellness or “booster” shots are a common addition to juice cleanses as a little something extra in between the main juices. They’re on my list of recommendations for juice cleanse beginners because they can help to boost your energy during a cleanse. 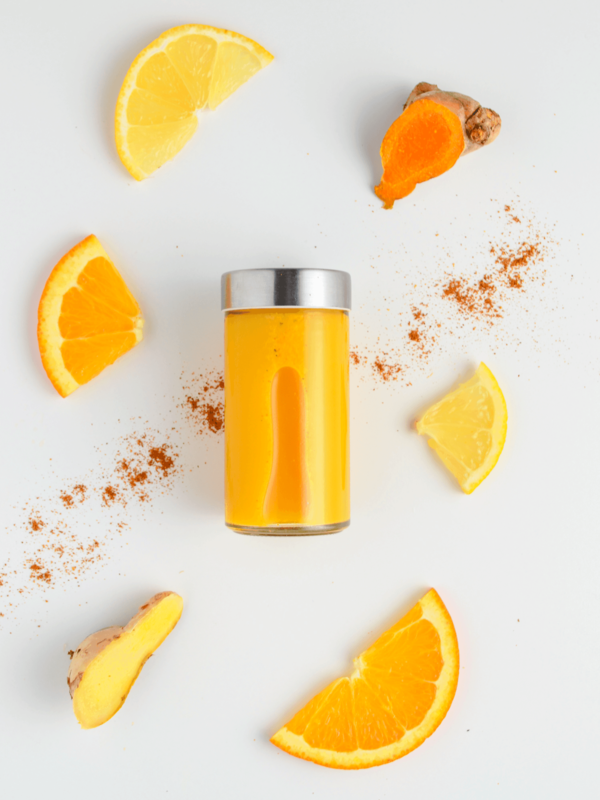 But these ginger turmeric shots are specifically made for their anti-inflammatory properties. They’re also great for boosting our immune systems. Not to mention they taste like little bottles of sunshine (trust me that’s a real flavor). So what makes these wellness shots so healthy? The main active ingredients are gingerols (from ginger) and curcumin (from turmeric). These plant compounds have powerful medicinal properties with a variety of potential health benefits. Through juicing, we are able to get a very concentrated dose of gingerol and curcumin that would be difficult to achieve any other way. Turmeric and ginger are both known for the “spicy” burning sensation they have when eaten. That’s why shots are the perfect method of delivery for this healthy juice. A glass full of straight ginger or turmeric juice would be pretty unpleasant, but shots mixed with added lemon and orange juice are delicious! The strong flavors of turmeric and ginger also make them great for flavoring other healthy juices without the need to add lots of high sugar fruits. I use ginger in this green goddess juice and my easy blender carrot juice recipe! Wash and dry the fresh produce. Peel the lemons and oranges. Cut the fresh produce to size so that it will fit in your juicer. Bring 3/4 cup of water to a boil in a small pan. Once the water is boiling, add about 1/4 cup of turmeric root and boil it for 10 minutes. After 10 minutes, remove the turmeric root while reserving the liquid in the pan. Put liquid in the fridge to cool. Fresh Tip: Heating the turmeric first helps to increase the absorption of its main active ingredient – curcumin. Using a juicer, juice the turmeric root, ginger root, lemons, and oranges. Stir in the cayenne pepper, black pepper. Stir in the remaining cooled liquid from boiling the turmeric. *Optional: To help with absorption, stir in 1/4 tsp of oil if you aren’t taking the shots with food. The curcumin in turmeric is a powerful anti-inflammatory compound, but unfortunately it is poorly absorbed by our bodies. Luckily, there are a few ways we can substantially increase curcumin’s effectiveness and absorption rate. Now I’ll be honest, juicing can be a bit of a hassle because most juicers are hard to clean – especially with turmeric because it stains literally everything. If you don’t have a juicer (or don’t want your hands stained orange for the day), you can still try these potent little health tonics at most cold pressed juice bars. My favorite wellness shots are from a company called Jus By Julie. They even ship their shots and juice cleanses all over the US. You can also try their other shots like chlorophyll (great for cleansing) or wheatgrass for a super dose of nutrients! Wash and dry fresh produce. Peel the lemons and oranges. Bring 3/4 cup of water to a boil in a small pan. Once boiling, add turmeric root and boil for 10 minutes. After 10 minutes, remove turmeric root while reserving the liquid in the pan. Put liquid in fridge to cool. While liquid cools, juice the turmeric root, ginger root, lemons, and oranges in a juicer. Stir in the cayenne, black pepper, and oil. Stir in the remaining cooled liquid from boiling the turmeric. Pour into shot glasses and enjoy! Store the leftover ginger turmeric shots in an air tight container in the fridge. They will last about 2-3 days. The active ingredient in turmeric called “curcumin” is not easily absorbed by our bodies. A compound called “piperine” in black pepper increases the absorption of curcumin by 2000%. Absorption is also increased by heating the turmeric. Curcumin is fat soluble so adding oil or taking the shots with a meal will increase their effectiveness. Where did you get those mini glass containers? I have large sized ones that look similar and would love to have all my bottles look the same (for aesthetic purposes). Hey Shiv, I got these ones from Bed Bath and Beyond. They are little spice jars but they’re the perfect size for these shots! When using the turmeric powder, do you still boil it in water prior to cooling and adding to the mixture? I haven’t tried making this recipe with just the turmeric powder yet, but it would depend on how your turmeric is processed. If it’s specifically turmeric that is meant to be taken as a supplement then it is most likely already made bioavailable so there would be no need to boil it. If it is just some turmeric found in the spice section of your market then you might want to boil it first. You would need to use less water though, try maybe a 1/4 cup of water. The boiling step isn’t necessary, it just makes it so our bodies can absorb the curcumin in the turmeric slightly better. The most important thing you can do to increase this absorption rate however is adding the black pepper for the piperine.